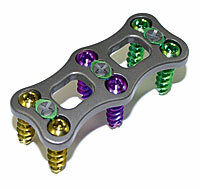 The ACP1 Cervical Plate System includes 1, 2, 3, and 4 Level Plates. Each is pre-curved to fit the natural lordotic curve of the spine. The locking mechanism located between each screw hole pair allows easy screw placement followed by a simple tightening of the locking screw to prevent screw migration. Self-Drilling/Self-Tapping Screws are available in both variable and fixed angle versions and color coded for easy recognition.